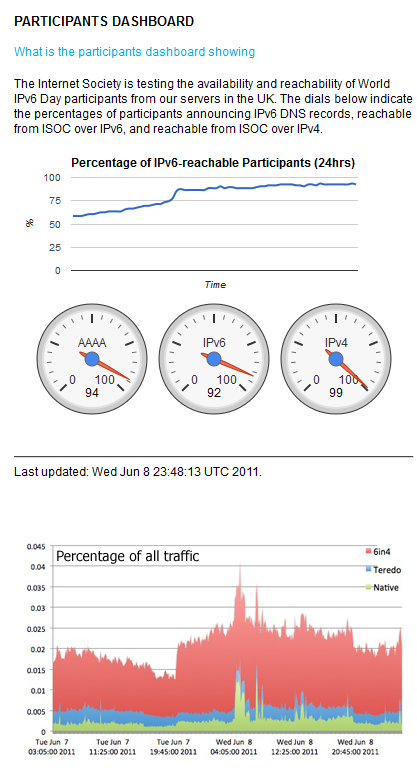 This server has received 2229335 hits from both ipv4 and ipv6. As we reported in an earlier post, 2020Media took part in World IPv6 Day, which took place on 8th June 2011. For 24 hours (or more) major websites around the world turned on IPv6 access to test how well this technology actually worked in practice. 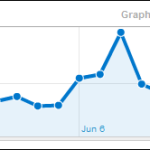 2020Media’s website and blog were reachable over IPv6 (in addition to IPv4 of course), and we saw an increase in our normal website visitors on the day. We had no reported problems and our servers coped without any errors, so we consider the day a success. Not so the boffins at Nominet, who were hosting one of the probes monitoring UK connectivity. For the early part of the day, routing problems there made UK sites, including the BBC look patchy. One good thing about IPv6 day was that where there were any kind of routing problem, because everybody was watching, those problems were resolved fast. Google “IPv6 Samurai” Lorenzo Colitti was pleased with the results. 2020Media has been working with IPv6 for several years now. Our core network has been IPv6 enabled for over a year now and we hold a 4 star rating as a RIPE LIR. We sponsor and host the IPv6 Matrix project which aims to record the gradual take up of IPv6 across the globe. IPv6 Services available from 2020Media now and in the near future include web hosting and email, server co-location, network transit, dedicated server rental and ADSL broadband. Our expertise is also available as consultants. If you have any comments or queries about IPv6, World IPv6 Day or 2020Media, please contact us.